The 1861-D Coronet Half Eagle was minted by both the US and Confederacy at the onset of the American Civil War. The 1861-D Coronet Half Eagle is the scarcest $5.00 coin struck at the Dahlonega Mint. It also played one of the most historically significant roles in US coin collecting. On April 8, 1861, four days prior to the opening shots of the American Civil War at Fort Sumter, Confederate forces seized the US branch mint in Dahlonega, Georgia. Up until the time of the southern capture, the Dahlonega Mint had coined 1,597 of the 1861-D Half Eagles. The rebels continued striking half eagles, though exactly how many is not known. Researchers estimate the number to be in the range of 2,500-3,500 pieces. Because the same federal dies were used by both the US and CSA, we cannot with certainty distinguish which governing authority struck what coins. However, numismatic scholars have observed that a good number of the 1861-D Coronet Half Eagle surviving population (numbering no more than 75 coins) are characterized by poor strikes and misaligned dies. The theory goes that these particular coins were minted by less experienced personnel, as might have been the case after the Confederate takeover. The 1861-D Half Eagle has displayed surprisingly sluggish price increases for a long period of time (see graph below). This flat line effect cannot be explained because of lack of interest; to the contrary, collectors have always respected the 1861-D as a front row eyewitness to the earliest events of the War Between the States. The 1861-D Coronet Half Eagle is a rare, historically significant US gold coin. One would expect to see more impressive value increases compared to what we've actually experienced. The blue line above charts the percent value increase of the 1861-D Half Eagle in F-12 condition since Jan 2000. For a long time, the percent increase was practically flat. 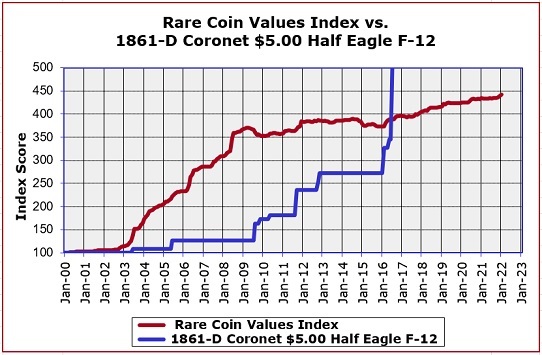 Finally, in 2009, prices picked up considerably, but the performance of the 1861-D still falls far below the Rare Coin Values Index, which is depicted by the red line. The Index monitors the percent increase fluctuations of 87 representational rare United States coins. The goal of the Index is to get a feel for the health of the US rare coin market. The 1861-D Half Eagle is one of the 87 coins included in the Index. All Index data is updated monthly.